The description sums it up pretty well. Callie loves theater. Callie builds theater sets. Callie meets other theater lovers. Middle-school antics ensue. I wasn't overly enthusiastic about this particular title. The artwork is fun and interesting, but the characters lack something. I'm not exactly sure what...I guess depth. And while I applaud not being afraid of diversity and tackling sensitive issues, in this case homosexuality, it seemed too stereotypical and a bit overdone in this particular story. Kudos to showing tweens who have a passion for extracurricular activities outside of sports and who actually follow through on tasks. 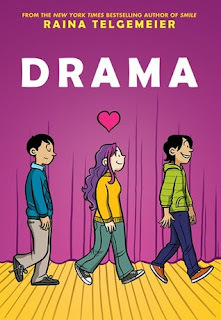 If you're looking for a graphic novel option without superheroes that is set in a middle school, take a look at Drama by Raina Telgemeier.